A group of Vilnius Gediminas Technical University (VGTU) administration and research staff participated in the Research and Innovation Staff Exchange project HORIZON 2020 (Marie Curie Research and Innovation Staff Exchange) Cluster Development Med (CLUSDEVMED) MSCA-RISE-2014 No:645730. They implemented project secondments to project partner – Academy of Scientific Research and Technology (ASRT) in Cairo, Egypt. The National Head of the Horizon 2020 project CLUSDEVMED is Professor Manuela Tvaronavičienė. Representatives of VGTU administration Dovilė Ulinskaitė, Viktorija Čeikutė and Valerija Bernotienė and Associate professor of the Faculty of Fundamental Sciences dr. Irina Vinogradova were welcomed by the president of the ASRT Prof. Mahmoud M. Sakr. During the visit in the Academy, representatives of VGTU participated in meetings with researchers from ASRT as well as from other institutions, universities, research centres. Such topics, as financing, legal regulation aspects, Public Private Partnership (PPP) possibilities in solar cluster fields, influence and possibilities of innovations and internationalization, opportunities for cooperation on the preparation of scientific publications, research and further scientific cooperation topics were discussed, experience and knowledge was shared. In addition, several visits to companies of Energy Sector were organised in order to introduce representatives from VGTU with the renewable energy in Egypt: solar energy, hydropower. The group had a visit to largest solar installation in the world – Benban Solar Park in Aswan, which is being built at this time. Benban Solar Park is a photovoltaic power station under construction with a planned total capacity of 1650 MWp which corresponds to an annual production of approximately 3,8 TWh. Once completed, Benban will be the largest solar installation in the world. Benban Solar Park located on an area of 37.2 km2, which is subdivided into 41 plants. Furthermore, topics of a higher education system, STEM subjects, professional education in Egypt, financing of the studies in state and private Universities and Academies were analysed. “Future4Technologies” initiation was presented during the meeting with Eng. Mohamed Salem, Founder and Team Leader of Future Technologies project. The urgency of supporting STEM subjects at a young age is becoming more relevant than ever. “Future4Technologies” is a non-profit initiation to teach kids and elementary school students around the world the practical experience of how to make technologies for the future by providing precollege educational courses in science, technology, engineering, and mathematics (STEM). 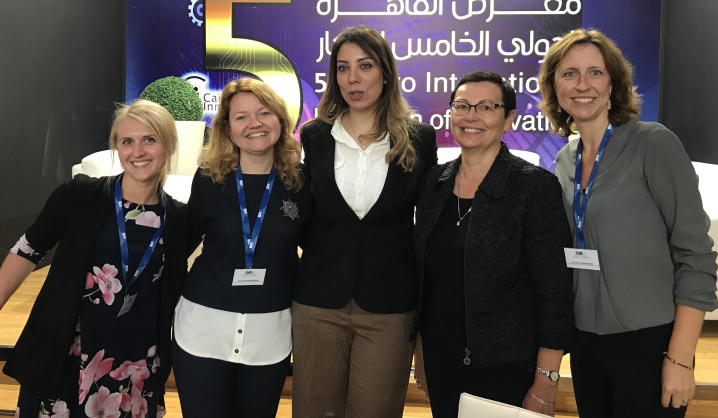 The highlight of the visit to ASRT participation in a Conference “Women Empowerment through Science, Technology and Innovation (WE-STI 2018)” and in the 5th Cairo International Exhibition of Innovations organized by ASRT. These events fully revealed the newest projects of Egypt researches from different fields. The aim of those events is fostering of the culture of innovation in order to increase the country’s productivity and competitiveness, and reduce poverty and inequality.